The National Law Review (NLR) recently honored Ward and Smith with the Go-To Thought Leadership Award for "coverage of North Carolina real estate matters, including litigation, regulations, and legislation." According to the press release, Ward and Smith's attorney-authors provided "thoughtful legal analysis on a variety of real estate issues." NLR singled out the firm's insights into community associations, specifically the advice given to boards of directors concerning proper governance and administration, as the driving factor behind being selected for this distinction, which was awarded in late-December. 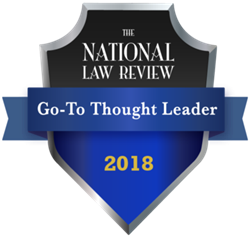 Recipients for the "Go-To Thought Leadership Award" were selected by the NLR's editors from a pool of more than 100,000 legal news and analysis articles. The publication only recognized 65 authors and legal organizations for their contributions to reporting on complex legislative and litigation news, as well as strategic insight and overall legal industry knowledge. This is the first year the National Law Review formally recognized the talents of less than one percent of its contributors. Additionally, in 2018, articles about lending and cryptocurrency were extremely popular with Ward and Smith readers on JD Supra, one of the world's largest legal content publishing platforms. Attorney-author Lance Martin is a Board Certified Bankruptcy Law Specialist, and his series focused on lenders and Bitcoin occupied four out of the top five most popular Ward and Smith posts on JD Supra. Martin's work was viewed almost 40,000 times over the course of the year. For more articles about real estate, community associations, virtual currency, and much more, visit our News and Insights page.